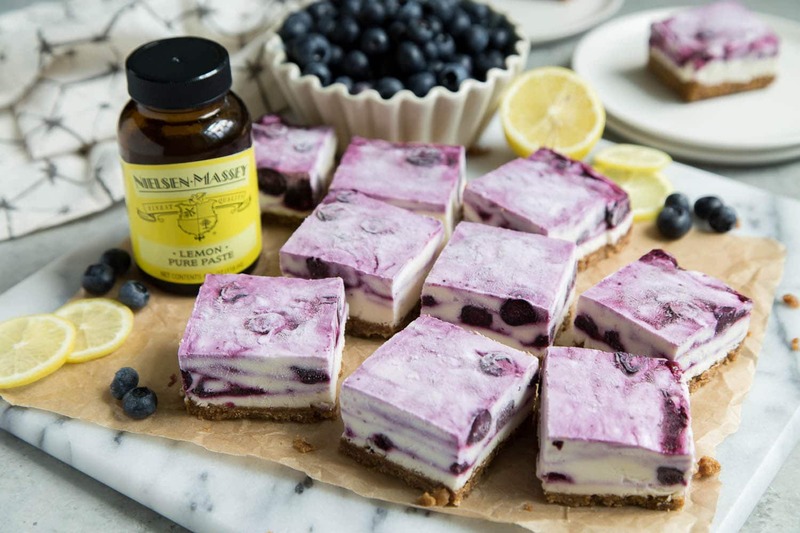 These frozen lemon blueberry cheesecake bars are a delicious no-bake summertime treat. 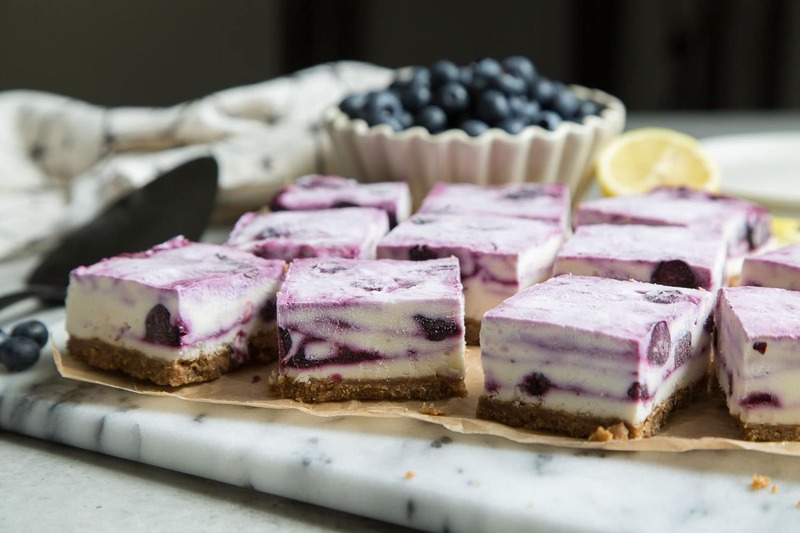 Made with a gingersnap cookie crust and a luscious combination of bright lemon and sweet blueberries, you’ll want this stocked in your freezer at all times! Disclosure: Thanks to Nielsen-Massey for sponsoring this post. For more information on their products and for additional recipe inspiration, follow Nielsen-Massey on Facebook,Instagram, and Pinterest. As always, all opinions mentioned here are entirely my own. Summer is here. The sun is out, the temperature is on the rise, and I just want to sit poolside drinking ice cold beverages and snacking on frozen treats all afternoon long. 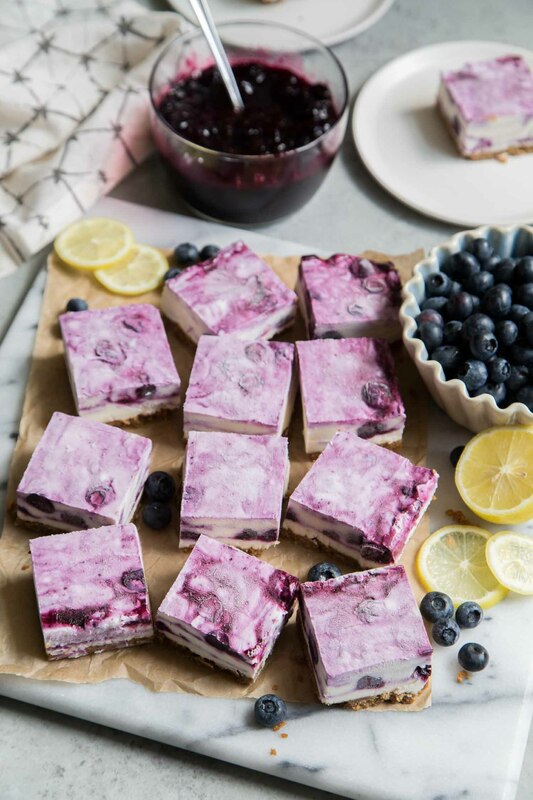 Instead of the usual ice cream and popsicles, I’m snacking on something more exciting this summer: frozen lemon blueberry cheesecake bars! It has the same silky creaminess of a classic cheesecake without the hassle of baking. I always keep lemons stocked in my kitchen. That bright pop of citrus is a welcome addition to pretty much all foods. From grilled proteins and roasted vegetables to fruit cobblers and summer cocktails, a squeeze of lemon adds a pleasant freshness. I want to introduce you to a new lemon staple in my kitchen: Pure Lemon Paste by Nielsen-Massey (the same brand you already know for excellent vanilla extract). This pure lemon paste provides that iconic bright citrus flavor without having to juice or zest fresh lemons. Made using oils from high quality California lemons, this lemon paste is produced using all-natural, GMO-free, certified gluten free, certified Kosher, and allergen-free ingredients. How to use lemon paste? The Pure Lemon Paste has a bit of a sweet kick instead of a lip-puckering sour taste. It is a thick paste (similar to vanilla bean paste) that can be easily incorporated into various foods. It can be used in baked goods, whipped into creams and frostings, and even mixed into drinks and cocktails! You will need an 8-inch square baking pan to make these cheesecake bars. It is important to line the baking pan with parchment paper (or wax paper) to allow for easy unmolding. The cheesecake filling is a combination of cream cheese, sour cream, heavy cream, powdered sugar, and lemon paste. 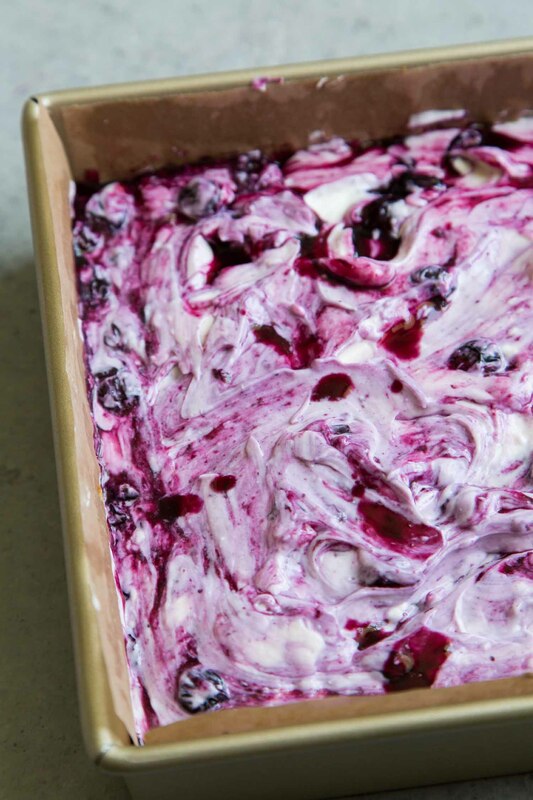 Swirled into the cheesecake batter is a sweet blueberry sauce (made from fresh blueberries, sugar, and lemon paste). I suggest making a double batch of the blueberry sauce. It’s nice to spoon a little drizzle of the tasty sauce over the frozen cheesecake bars! The assembled frozen lemon blueberry cheesecake bars need at least 4 hours of freezing time. However, it is best to allow the cheesecake to freeze overnight. Once frozen, use a sharp knife to slice the cheesecake. Store sliced cheesecake bars in an airtight container in the freezer until ready to serve. In a heavy bottomed sauce pot, combine blueberries, sugar, and water. Bring to a simmer and allow to cook for 5 minutes until sugar has dissolved and half of the blueberries have burst. Stir often to ensure mixture does not burn along the sides of the pot. Remove from heat and allow to cool. Transfer to a container and keep chilled in the fridge until ready to use. Once mixture is cold, stir in lemon paste. Cut a length of parchment paper long enough to line the bottom of an 8-inch square pan with extra hanging over the sides. Set aside. Combine ground gingersnap cookies, melted butter, and vanilla until mixture is well moistened. Use the flat bottom of a drinking glass (or measuring cup) to press mixture into the bottom of prepared baking pan. Fit a stand mixer with the paddle attachment. In the bowl, beat cream cheese until smooth. Scrape down bowl as needed to ensure thorough mixing. Add sour cream, powdered sugar, and cream. Mix on low speed until mixture is thick and smooth. Add lemon paste and mix until incorporated. Transfer about 1/3 of filling to prepared crust. Spread into an even layer. Dollop chilled blueberry sauce on top. Swirl sauce as desired. Repeat adding cheesecake filling and blueberry sauce. Spread mixture into an even layer. Cover with plastic wrap or foil allow to freeze for at least 4 hours, overnight is best. 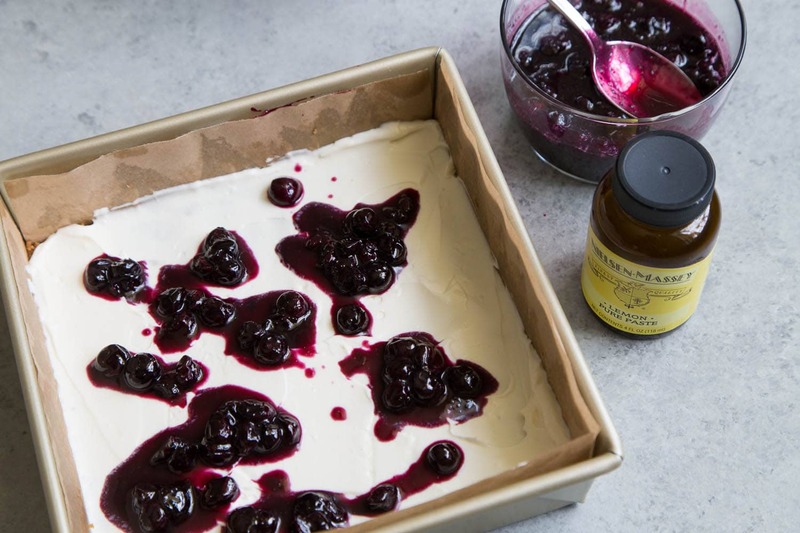 Use the parchment paper overhang to help unmold frozen cheesecake. Use a sharp knife to slice cheesecake into 2-inch square bars. Keep frozen until ready to serve. More information on the pure lemon paste can be found here. If you have difficulty unmolding frozen cheesecake from pan, submerge baking pan in room temperature water for 3 second intervals two or three times. Store sliced cheesecake bars in an airtight container in the freezer. 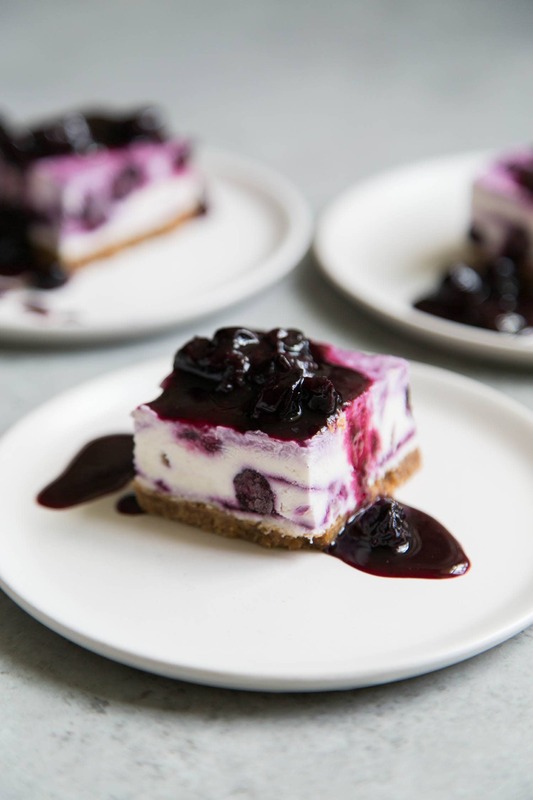 If desired, serve frozen cheesecake with additional blueberry sauce.